At what level you can control security access for pricing entities ? What is the difference between price list, price agreement and price books ? what is price list ? Can we have multi-current price lists ? Can we have price breaks in a price list ? What is GSA price list ? Does oracle supports copying price lists ? Can we do mass update of price lists ? 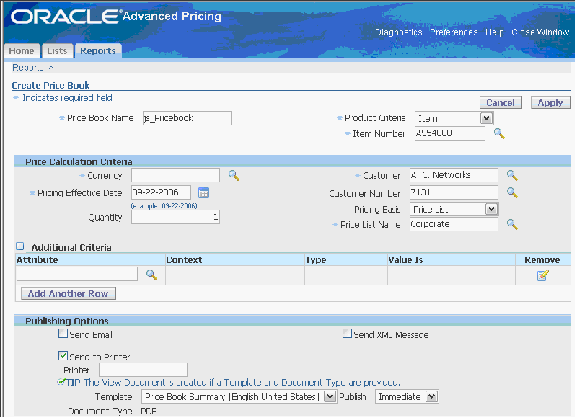 Does oracle supports archiving price lists ? 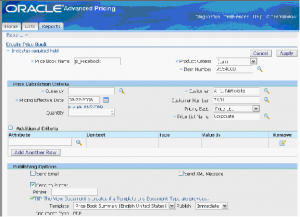 Does oracle supports purging price lists ? Does oracle supports deleting price lists ? What are advantage of using pricing attributes to define list price ? How price lists and modifiers are related ? How do you redeem accruals in advanced pricing ? Is purging supported for modifiers ? Is archiving supported for modifiers ? What are the different types of modifiers ? How do you setup formula based pricing ? What is Qualifier group ? What is pricing agreement ? Can we revise price agreements ? What is price book ? Can we use modifiers to setup surcharge ? Can we use modifiers to setup buy one item and get discount on different item ? Can we use modifiers to issue a coupon for later redemption ? Can we use modifiers to override terms ? Can we use modifiers for freight and special charges ? Does oracle supports overriding selling price ? What is difference between discount and surcharge ? Can we use modifiers for item upgrades ? Price Books feature is relatively new feature in R12. This functionality let you generate and publish price books to customers from multiple price lists and formulas. 1 ) Enter the price book name for each customer. 2 ) Select the operating unit to which price book is attached to. 3 ) Pricing perspective: Here you select the core application in which pricing engine is executed i.e. order management for sales order price execution. When price book generation program runs it simulates the pricing engine to derive the prices for a customer to arrive at list price. 4 ) Product Criteria: You can choose All items, specific item, item category or price list. Addition attribute criteria: You can choose additional attributes to determine the price. Template: You can choose the template format for publishing the price list. Document Type: Select the document type for publishing: Options available are EXCEL, PDF and RTF. Publish: You can publish immediately or on a scheduled date. Once you are ready click on ‘APPLY’ to generate and publish the price book. Price Books feature is relatively new feature in R12. This functionality let you generate and publish price books to customers. Delta Price Books: This price book contains the additions & changes to prices since last full price book published. Price Books can be published immediately or scheduled for publishing on a future date. Price books can be published to EXCEL, RTF, PDF and XML formats. Published price books can be e-mailed, printed on a printer or XML message sent to a directory. The important feature of price books is it can be based on one or more price lists, modifiers, pricing formulas, including multi currency price lists. QP: E-mail From Address: This profile option defines the from e-mail address for any e-mails that are sent from the price book feature. QP: External Default Pricing Perspective: This profile option sets the default pricing perspective for all external users. QP: Inbound XML Messaging Responsibility: This profile option defines the responsibility to be used for inbound XML messages. QP: Internal Default Pricing Perspective: This profile option sets the default pricing perspective for all internal users. QP: Pricing Perspective Request Type: This profile option defines the mapping between a Pricing Perspective (calling application) and the Request Type that it uses.